"The customer is always right" is a mantra held sacred by all employees at Spartan Logistics, from the truck drivers to the father-and-son duo at the helm of this economy-defying company. Steve Harmon (fifth from left) attributes the company’s $3.7 million revenue growth since 2006 to its focus on customer service. At Spartan Logistics, president and managing director Steve Harmon strives to keep all his employees focused on the same goal. Whether you’re a truck driver, a warehouse associate, or a member of the management team, the charge remains the same: put the customer first. At a time when many businesses have been forced to close their doors, Spartan Logistics has been expanding. The company added locations in Cincinnati and Cleveland and about 20 employees in June 2010. Even more telling are the numbers, with Spartan Logistics boasting a $3.7 million revenue growth since 2006. 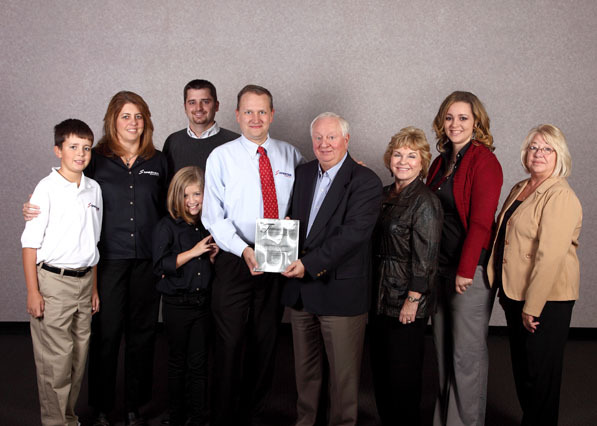 His father, Ed Harmon, started Spartan Logistics in 1988 in Columbus, Ohio. Today the company operates warehouses in six cities across three states—Columbus, Cincinnati, Toledo, and Cleveland, Ohio; Marion, Indiana; and Anderson, South Carolina. Focusing primarily in the food-and-beverage industry, Spartan Logistics offers a wide range of services, including storing and shipping commercial goods for its customers. A fter leaving a job with one of the Big 6 accounting firms, Steve joined Spartan Logistics full time in 1996 as chief financial officer. In July 2010 he became president and managing director of the company. “I tell friends of mine that are in business with their families, particularly their sons, that it’s the best thing you could ever do or the worst,” says Steve’s father, Ed, who currently serves as chairman of the board of directors. Fortunately for him, his decision to work with his son was a great one. “We have total admiration and respect for each other,” Ed says. And Steve agrees, describing the opportunity to work with his father as “one of the great joys of my life.” Ed Harmon says the primary lesson he hopes he’s taught his son about business is the importance of putting the customer first. This focus, Ed says, even helped maintain a healthy professional relationship with his son. Steve admits that he asks these questions when considering his employees: “Are we hiring people we want to work with? Are we hiring people that we like?” He goes on to explain, “This isn’t to say we’re hiring people that are just like us.” Instead this means choosing workers who will be team players and will forgo gossip to be good communicators and problem solvers. While Steve believes his customers should come first, this doesn’t mean he neglects the well-being of his employees. In January of 2011, Harmon launched a program to help employees with three of the most common New Year’s resolutions. The company sponsored a weight-loss contest with cash prizes to encourage workers who wanted to get in shape. The company also offered to reimburse employees who successfully completed smoking-cessation programs. And the company matched employees’ social-security rebates to help them put away more money in their 401k plans.